The manufacturers of Invisalign®, Align Technology Inc., are headquartered in California, USA and were founded in March 1997. Invisalign® is an invisible way to straighten teeth without the need for metal braces, using instead a series of clear, plastic “aligners” (as pictured opposite) which slowly move teeth over time, according to an individual preset dental prescription. Invisalign® is marketed in the United States, Canada, Australia & Europe. Firstly your dentist or orthodontist will take x-rays, photographs and moulded dental impressions of your teeth and send these off to the Invisalign® laboratories with a prescription for treatment. Your dental impression is then scanned into a computer to make a 3-D model of your teeth and gums. Technicians at the laboratory are then able to isolate each tooth using the computer software and move them on screen according to the prescription from your dentist. The software then simulates this movement in stages, moving different teeth, slowly and at different times until the final result is achieved. Your practitioner can then check this simulation online, and make any changes, to make sure that they are happy with the proposed correction before your personalised set of aligners is made. The Invisalign® laboratories then use special laser scanning technology, whereby a laser beam follows the pattern of digital information from the computer and solidifies liquid resin layer by layer, to produce the set of plastic aligners which represent each tooth movement generated by the computer software for your prescription. 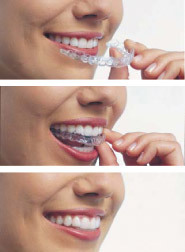 It works to correct your teeth through a series of invisible, removable, and comfortable plastic aligners. By being invisible it is said that no one can tell you`re wearing them. They are removable so you can eat and drink, brush and floss your teeth with ease and due to the lack of metal components as often found with brace systems, they are considered more comfortable and less likely to cause abrasions such as mouth ulcers. Generally each aligner in a treatment sequence is worn for 2 weeks, meaning that as you change to the next one your teeth slowly move until they are straightened into their final position, as prescribed by your dentist or orthodontist. Depending on your individual case, the total treatment time can take 9 – 15 months with the number of aligners worn during treatment being approximately 18 – 30. Your dentist will schedule regular appointments - usually about once every six weeks so they can be sure that the treatment is progressing as planned. The U.S. Food and Drugs Administration (FDA) approved the marketing of Invisalign® in August 1998. Must only be performed by specially trained and experienced dentists and orthodontists. and some practitioners have also been able to show success in relieving complex conditions such as overbites, underbites and crossbites. 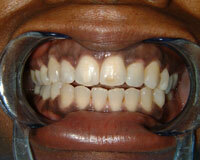 Images provided courtesy of Dr Raj Kumar at Forma Dental Practice. Please see Dr. Raj Kumar`s website for computer animated simulations showing how these Invisalign® aligners can straighten various types of teeth. Dr Raj Kumar is The Consulting Room™ medical advisor on Invisalign® technology. The final results of Invisalign® are permanent. Some people may require a conventional or invisible plastic retainer following Invisalign® treatment to stop their teeth from moving incorrectly in future, but this is dependent on treatment outcome and only applicable to a small number of cases. Most people experience temporary, minor discomfort for a few days at the beginning of each new stage of treatment, i.e. when you change to the next aligner in the sequence. This is normal and is typically described as a feeling of pressure which indicates that the system is working and moving your teeth as prescribed. This discomfort typically goes away after a couple of days. Like other systems of “braces”, Invisalign® aligners may temporarily affect the speech of some people, giving you a slight lisp for a day or two at the start of treatment, until your tongue gets used to having the aligners in your mouth, at which point any speech impediment will disappear. Smoking is not advised whilst wearing Invisalign® aligners as it can cause them to discolour. Invisalign® can be used to treat people with “fully-erupted molars”, i.e., once the second set of teeth are full formed after childhood; hence treatment can only be done on those people above the age of approximately 12 -14 years old. There is also no upper age limit for treatment. Those people who have an existing bridge in place. This is because a bridge firmly links two or more teeth together and can therefore produce significant resistance to tooth movement produced by Invisalign®. Studies have shown that people with gum problems can also be treated with Invisalign® aligners; their cleaning improves as well as the condition of the gums. The cost of Invisalign® depends on the amount of correction required for your teeth, and ultimately the amount of aligners needed to achieve it. Generally it is more expensive than having traditional metal braces and prices for private treatment range from £3,000 to £7,000. Monthly payment plans are often available to assist with payment. Four-premolar extraction treatment with Invisalign. J Clin Orthod. 2006 Aug;40(8):493-500. A Premolar Extraction Case Using the Invisalign((R)) System. J Orofac Orthop. 2006 Sep;67(5):385-394. 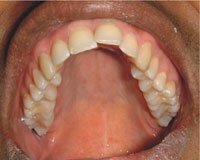 Turatti G, Womack R, Bracco P.
Incisor intrusion with Invisalign treatment of an adult periodontal patient. J Clin Orthod. 2006 Mar;40(3):171-4. Outcome assessment of Invisalign and traditional orthodontic treatment and subsequent commentaries. Am J Orthod Dentofacial Orthop. 2006 Apr;129(4):456. The treatment effects of Invisalign orthodontic aligners: a systematic review. J Am Dent Assoc. 2005 Dec;136(12):1724-9. Am J Orthod Dentofacial Orthop. 2005 Sep;128(3):292-8; discussion 298. A Comparison of the Periodontal Health of Patients during Treatment with the Invisalign(R) System and with Fixed Orthodontic Appliances. J Orofac Orthop. 2005 May;66(3):219-229. J Clin Orthod. 2005 Apr;39(4):259-63. 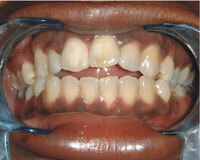 Surgical-orthodontic treatment of two skeletal Class III patients with Invisalign and fixed appliances. J Clin Orthod. 2005 Apr;39(4):245-58. Advances in digital technology and orthodontics: a reference to the Invisalign method. Med Sci Monit. 2005 May;11(5):PI39-42. Epub 2005 Apr 28. J Orofac Orthop. 2005 Mar;66(2):162-73. Clinical trials needed to answer questions about Invisalign. Am J Orthod Dentofacial Orthop. 2005 Feb;127(2):157-8. Schuster S, Eliades G, Zinelis S, Eliades T, Bradley TG. Structural conformation and leaching from in vitro aged and retrieved Invisalign appliances. Am J Orthod Dentofacial Orthop. 2004 Dec;126(6):725-8. Am J Orthod Dentofacial Orthop. 2004 Mar;125(3):19A. Click for ALL Invisalign ® clinics in the UK & Ireland registered and verified by Consulting Room.